Here at BCA we believe in Perfection before Progression in tumbling. We know that ensuring the athlete can perform the skill perfectly means they have a better chance of gaining more advanced skills in a safe and timely manner. Level 1 Tumbling focus on proper technique and execution of: Rolls, Handstands, Cartwheels, Round Offs, Walkovers as well as connecting skills. 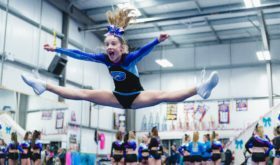 Level 3 Tumbling will focus on proper technique and execution of: Round Offs, Multiple Handsprings, Tucks, Aerials, as well as connected L1, L2, and L3 skills. Level 4 Tumbling will focus on proper technique and execution of: Round Offs, Multiple Handspring Tucks, Layouts as well as connected L1, L2, L3 and L4 skills.